Colleen Patrick-Goudreau » Colleen’s Animal Prayer. Animal rights activists have put up a new roadside memorial on Highway 151 near Mount Horeb celebrating several cows that perished a month ago after a semi-trailer hauling them to slaughter rolled over. While some cows died in the Oct. 15 crash near Highway E when weight shifted in the truck, other cows escaped and ran loose, prompting officials to close the highway for hours until they were rounded up, according to the Dane County Sheriff’s Office. The double-decker cattle trailer was traveling from Iowa to a Wisconsin butcher, according to Channel 3000 in Madison. “PETA hopes its memorial sign will remind tractor-trailer drivers of their responsibility to the thousands of animals they haul to their deaths every day—and remind everyone that each of us can help stop this violence by going vegan,” the organization said in an emailed release Monday. 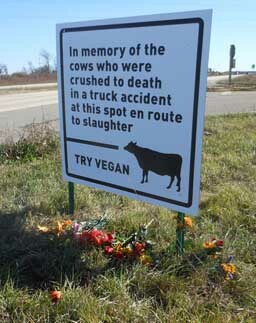 PETA posts memorial sign for cows killed in Mount Horeb truck crash. 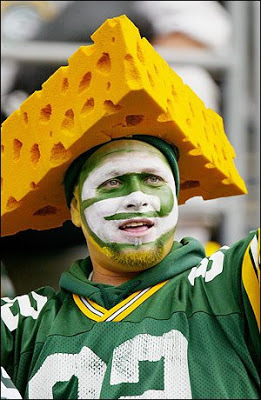 Mt Horeb, WI – A loaded cattle trailer traveling from Iowa to a Wisconsin butcher rolled over Tuesday night closing Highway 151. The crash happened west of Mount Horeb, near County Highway E, when the load shifted causing the semitrailer to rollover, according to a release. Deputies on scene said wind could have been a factor. They also said the double-decker trailer may have been more prone to tipping. Authorities closed both lanes of Highway 151 for several hours. Traffic was diverted at Highway 78 just outside of Mount Horeb. Officials said the driver of the semitrailer is injured but the extent of the injuries is unknown. Authorities believed the driver would be okay. The double-decker cattle trailer was transporting around 32 head, and the two levels made it more difficult to unload. With the top level sitting on its side, some cattle appeared stuck in the trailer. Area farmers continued to pitch in throughout the night to help haul the cattle off the road. Authorities also say some cattle may have escaped when it first happened, though, so far there have been no reports of seeing any missing livestock. According to the release, several of the cattle died at the scene. At least a couple had to be shot at the scene. A company from Marshall was called to take the carcasses away for rendering, which will then be used for products like pet food. Local farmers assisted at the scene. Cattle killed in rollover crash | News – Channel3000.com.